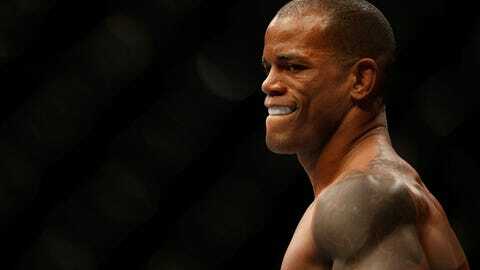 Hector Lombard wants a scrap with No. 7-ranked welterweight Jake Shields. The call never came, and he’s still waiting to hear who he might face next. As far as he’s concerned, it has to be a contender, someone to move him closer to the title. And the way the division is currently lining up, that only leaves one obvious answer. Lombard believes his dynamic style combined with strong takedown defense — he stops 75 percent of tries — will force Shields into an exciting matchup. The only fight that makes sense for me is Jake Shields. But that’s not exactly why he wants Shields. It’s just that there’s no other available candidate out there that can help him springboard towards his goals. Embattled champion Georges St-Pierre is currently on hiatus, No. 1 contender in waiting Johny Hendricks is hanging around in hopes of a probable rematch with the champ, Carlos Condit and Matt Brown are scheduled against each other. Meanwhile, Robbie Lawler and Tyron Woodley are Lombard’s teammates, so those matchups won’t happen, while others like Rory MacDonald and Demian Maia are coming off losses. Complicating things further, Shields has been openly chasing a scrap with Lawler. Lombard wants to fight as soon as possible. And he has no interest in waiting around to see what happens with other matchups. Lombard does not especially love Shields’ fight style, but was quick to acknowledge the success he’s had with it, including wins over Lombard’s aforementioned teammates Lawler and Woodley. Shields just has a knack of making the fight into his image. He makes it boring or I end up knocking him out. With 19 knockouts in 33 pro wins, Lombard is betting it’s the latter, especially with the experience of cutting down to 170 now in his past. He said that the move was a blessing, as it’s caused him to train harder. He called himself, "lazy, chubby and a bit of a glutton" in the past, but said the sacrifices of cutting weight have changed his outlook on his career. "You saw me in my last fight? I looked so weird, huh? " he said of his sunken cheekbones. "Like someone from another planet." Speaking of extraterrestrials, Lombard gave an interesting take on St-Pierre’s recent hiatus, based upon past GSP statements on "losing time" in what he thinks could be cosmic encounters. How can [GSP] think about aliens going to come up and take you? Some people have suggested St-Pierre’s bizarre statements are reason enough to give him his sabbatical, but Lombard doesn’t care why he wants it, saying that St-Pierre has done plenty for the sport and and can do whatever he wants. That said, he wants St-Pierre and the rest of the welterweight division to know that he’s coming. Whether it’s GSP holding the belt, or Hendricks, or someone else, Lombard is pushing forward and has every intention of entering the title picture in 2014. To him, the only unknown remaining is when exactly he’ll get to that top contender role and reach the heights ascribed to him when he came to the UFC on that big free-agent contract.